At M&M Income Tax Service, if you are an early season tax filer (i.e. you file your tax return in January and/or early February) you are simply looking to get the “Biggest & Fastest Refund Allowed by the IRS Guaranteed!” You feel like the sooner you file your tax return the faster you are going to get your tax money, the faster you can get caught up on your bills, the faster your life after the Christmas holidays will return to normal. 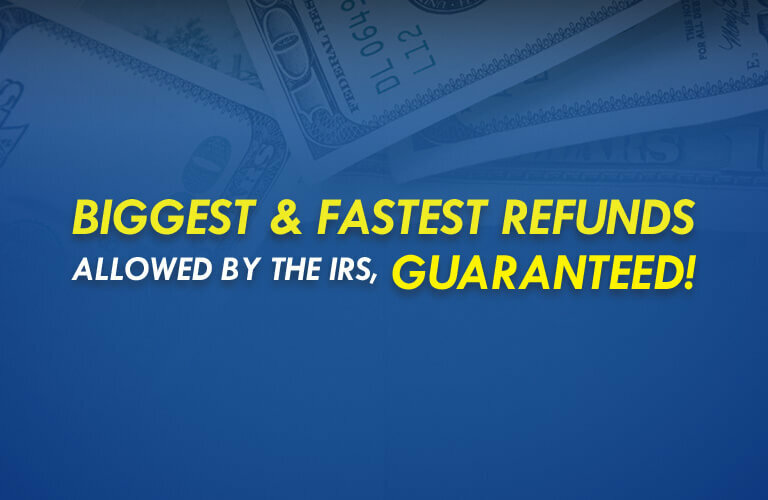 At M&M Tax Service, we provide the “Biggest & Fastest Refunds Allowed by the IRS, Guaranteed” as a normal part of our service to all our tax clients. Here is how we do it! What does “Biggest” mean? Biggest means that you want the “Biggest” possible tax refund or more money in your tax refund. So, how do we get you bigger tax refunds? It all starts with experience; we have experienced tax preparers who have been trained to get you the “Biggest” refunds legally allowed by the IRS. Our tax professionals have each gone through extensive tax training in tax topics that generate bigger tax refunds such as Earned Income Credit, American Opportunity Credit, Additional Child Tax Credit, plus many more topics. The key to bigger tax refunds is knowing how all the tax credits interrelate and affect each other. What does “Fastest” mean? Fastest means that you want access to your tax money as soon as possible, because you have got big plans for your tax refund! We know your tax refund is very important to you and getting access to your tax money as soon as possible is critical. That’s why each and every year it’s our goal to bring you the best possible tax refund options, like our same day Easy Advance* up to $6,000. That’s right, free (i.e. no additional cost to you) when we prepare your federal tax return and you select our “File Now, Pay Later” option! What does “Guaranteed” mean? Guaranteed means that we will get you the Biggest possible tax refund legally allowed by the IRS. Our goal is for you to get the most money back without getting a letter from the IRS, so you keep you coming back as a tax client each and every year. We understand that your tax return has to be correct, so that your tax refund will be released to you as fast as possible. Accuracy is the key to being “Guaranteed”, so if one of our tax preparers misses something and your tax return has to be changed, we will fix it for you for free.